The Grand Trunk Railroad has been controlled by the Canadian National Railroad for most of its corporate life. 6 inch x 6 inch square tin sign of the Grand Trunk Railroads GT Letters logo. 6 inch x 6 inch square tin leaf logo sign of the Grand Trunk Railway. 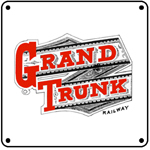 6 inch x 6 inch square tin logo sign of a logo used by the Grand Trunk Railroad in the late 1800s. A very rare logo indeed.